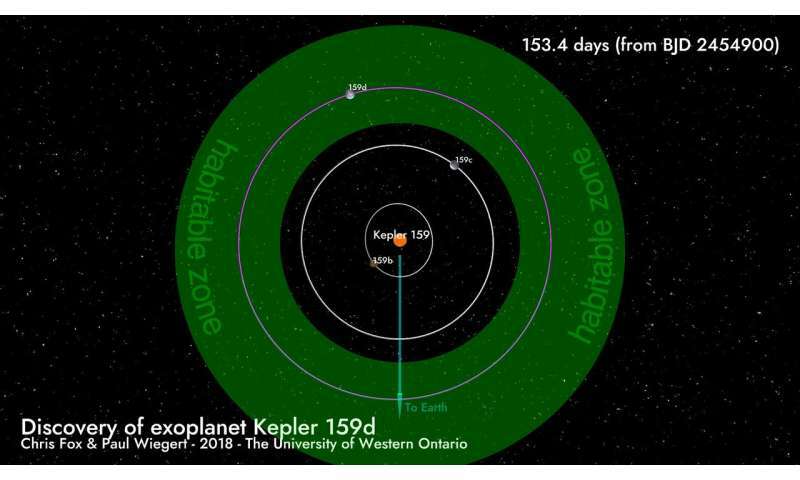 Teamed with Paul Wiegert, Graduate Program Director at Western's renowned Centre for Planetary Science and Exploration (CPSX), Fox discovered the exoplanet—provisionally known as Kepler 159d—by investigating gravitational effects on Kepler 159b and Kepler 159c. These two previously discovered exoplanets were detected by NASA's Kepler Space Telescope, an observatory in space charged with finding planets outside our solar system, particularly alien planets that are around the same size as Earth in the habitable regions of their parent star. 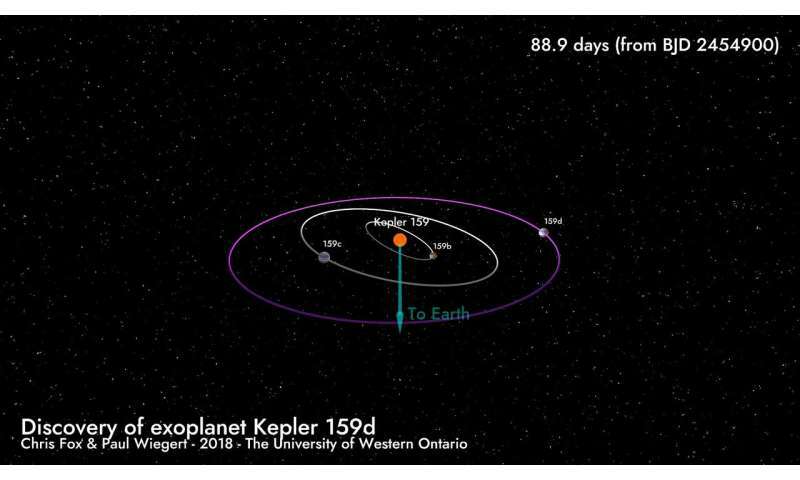 Kepler 159d was not actually seen by Fox and Wiegert rather it was variations in the orbits of Kepler 159b and Kepler that allowed the planetary scientists to deduce its presence. "I've been a space buff since I was a little kid, I watched all of the old sci-fi shows and I always wanted to go to another planet," says Fox. "We can't go to the planets quite yet, so this is as good as it gets for now." Kepler 159d has a mass comparable to that of Saturn, the second-largest planet in our solar system. And like Saturn, it is likely mostly composed of gases with no distinct solid surface. 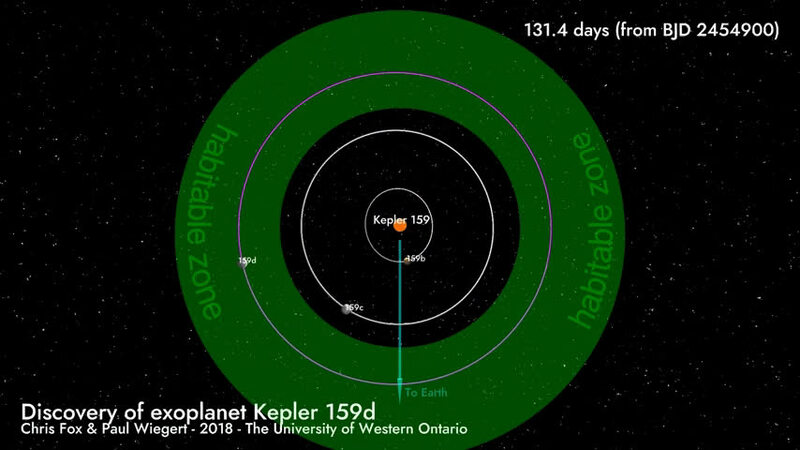 Whether Kepler 159d has rings or moons like Saturn is still unknown but what is known is that it orbits within its star's 'Habitable Zone,' which means temperatures are in the range suitable for Earth-life but there is no evidence on whether there is actually any life in the system. The central star of Kepler 159d's planetary system is a red dwarf star (spectral class M0V) with a mass estimated at 52 per cent of that of our Sun. Its surface temperature is about 3600 Celsius (3893 Kelvin) while the Sun's is 5500C (5770 K). The finding was published in the scientific journal, Monthly Notices of the Royal Astronomical Society.